You’ve probably noticed that the iPad has very few buttons. When holding the iPad in Portrait mode, there are the Power button at the top right, the Home button bottom center, and the Volume and Mute buttons near the top of the right-hand side of the iPad. How to Power Off the iPad: To power off the iPad, hold down the Power button for a few seconds, until you see the ‘Slide to Power Off’ bar across the top of the screen. Slide across that and the iPad will shut down. To restart it just press the Power button again for about 3 seconds. Uses for the Home Button: The home button is your key to navigating your way around the iPad. When you are in any application (or app as applications for iPad and iPhone are known) you simply press the home button to return to the home screen, where you’ll see all your app icons. If you have multiple home screens (which you will if you start adding more apps to your iPad) pressing on the home screen will take you back to the screen that the last used app is located on. To immediately jump back to the first home screen, just press the home button again from whichever screen you landed on. A double-press on the home button brings up the Multitasking Bar. This bar shows you all of your recently run apps. A single tap on any of them will switch you to that app – so this is a very fast way to switch between apps. From the Multitasking Bar you can also use basic controls for your Music media player app, adjust the brightness on the iPad, and toggle muting of sound on and off. Dock Connector Port: Just below the home button, on the bottom center of the iPad, is the dock connector port. This is used to plug in your sync and charge cable for the iPad. 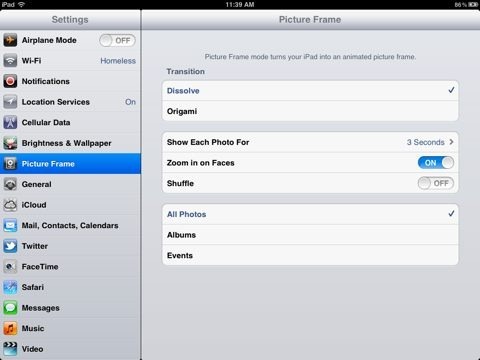 Taking a Screenshot of What’s on Your iPad Screen: Want to take a picture of what’s on your iPad screen? It’s easy to do. Just hold down the Home button and Power button simultaneously for a quick second. You’ll see the screen flash white for a moment. The image will be saved to your Saved Photos album in the Photos app. *** You can also create new images from existing pictures by using the screen capture method. For instance, you might have a picture of a person, showing their whole body. You can pinch to zoom in the Photos app on that image and zoom in on just their face, for example. When zoomed in, take a screenshot. That screenshot will immediately be added to your Saved Photos album. How To Force an App to Close: If you have an app on the iPad that has stopped responding properly, and will not close just by the normal method of pressing the Home button, here’s how to force it to close down: double-press the home button to bring up the Multitasking Bar and then tap and hold on any of the app icons shown in it. They’ll start wiggling and each icon will have a little minus sign at top left. Tap on the minus sign for the app that is misbehaving. How To Quickly Mute the iPad’s Volume: To mute the iPad’s volume (across all apps) you can hold down the volume down (bottom) portion of the Volume button on the right side of the iPad for 2 seconds. Or if you have chosen in Settings to use the button above the volume control as a mute switch, you can use that. How To Bring Up Search: Using the Spotlight search on the iPad is a great way to find things quickly and even to launch apps quickly. To bring up the Search screen, when you are at the first home screen just swipe left to right once. From any other home screen, just press the Home button once (to return to your first page) and then once again (don’t do two quick presses together – one and a pause and one more). *** You can decide exactly what is included in Spotlight searches via the Settings app. Go to Settings > General > Spotlight Search to set which areas of the iPad are searched when you use it. You can choose to include or exclude contacts, apps, mail, notes, and more. How to Hard Boot the iPad: A hard boot will very rarely be needed on the iPad but it is worth knowing how to do one for those occasions when it is called for. If your iPad becomes unresponsive – i.e. does not react to taps and gestures on the screen or to home button presses – then you need a hard reboot to snap it back to normal behavior. To perform a hard reboot you hold down the Power and Home buttons at the same time for close to 10 seconds. Ignore the Slide to Power Off bar across the top of the screen when it appears and just keep holding the two buttons until you see the iPad screen go black and then see the Apple logo on the screen as it restarts. Syncing and backing up information held on your iPad is a crucial part of making the best use of it, and keeping your information safe – from photos to documents of all types. There are two main ways to do this – you can do a connected sync when your iPad is connected to you PC via its sync cable. In iTunes on the PC you have a number of options for what and how to sync (photos, music, apps, books, and more) and you also get prompted to backup each time you sync. If you have the current version of the iPad operating system – iOS 5 – on your iPad then you have iCloud available for wireless and automatic backup. You can see your options for this under Settings > iCloud on the iPad. You also have the ability to sync to your PC over WiFi, so you don’t need to connect via the sync cable. Have a look at our tips post on how to setup WiFi sync for the iPad in iOS 5 for guidance on this. – Tap on app icons to open apps. – Tap buttons and icons within apps and games to get around and take actions. – Pinch outwards with your thumb and forefinger to zoom into images in all the built-in apps (Photos, Maps etc) and most 3rd party apps. Pinch inwards to zoom back out. – You can also double-tap to zoom in, in many apps – and double-tap with two fingers to zoom out. – Swiping up and down and left and right moves you around a page or between screens within apps. Swiping left and right moves you between home screens when you begin to have more apps than can fit on just one home screen (the limit per home screen is 20). – Tap and hold is also a useful touch action at times. For instance when saving images (see below for more on this). — In iOS 5 you can choose to enable Multitasking Gestures in Settings (Settings > General > Multitasking Gestures). These are superb for moving between apps and moving around more quickly on the iPad. They allow you to use four or five fingers to pinch to return to the home screen, swipe up to reveal the multitasking bar, and swipe left or right between apps. The dock is the bar that sits at the bottom of the home screen. It can hold up to six of your favorite / most frequently used apps, so that they are always easily at hand to open up. You can add and remove apps to the dock to fit your tastes. To remove an app from the dock tap and hold on the app’s icon until it (and all the others) wiggle, then simply drag it out of the dock. To add an app to the dock tap and hold on any app until the app icons begin to wiggle, then drag the desired app icon onto the dock. There are an incredible array of apps for the iPad – from games to productivity and reference apps, utility apps, eBook apps, newspaper and magazine apps from many of the leading print publishers around the world, music and navigation apps, and apps for just about anything you can think of. In all, there are over 170,000 apps designed specifically for the iPad as at this writing. The App Store is where you go to install apps on your iPad. You’ll need an account with Apple’s iTunes in order to use the App Store. It’s free to set one up though it does require that you specify a payment method. There are many great free apps for the iPad and also paid apps of course. The majority of paid apps fall somewhere within the $0.99 – $9.99 range, though there are some that are more expensive as well. The App Store makes it easy to browse for apps by category, or via the Featured area with sections for staff picks, New & Noteworthy apps, What’s Hot lists, new releases by date and more. You can also search for individual apps by name or keyword. Each app has a page with details on what it does, key features, screenshots, customer ratings and more useful information. Once you choose an app you want, installation is just a single tap (and an entry of your iTunes account password) away. The App Store also automatically keeps track of updates to all your installed apps for you. Updates provide fixes for any issues an app may have and new features and improvements to the app. The App Store will show a little red badge on its home screen icon when new app updates are available for you to download. You can then go into the App Store, go to the Updates tab, and download your updates with a simple tap. See our selections for Best Free iPad Apps and our Best iPad Apps of 2011 to give you some great options to get your app collection started. How To Remove an App: If an app is not what you expected or is no longer useful to you, it’s easy to get rid of it. Just tap and hold on an app icon until the icons start wiggling. You’ll see a little X within a black circle at the left top of the app icons – tap on that X on any app you want to remove. How To Move Apps on and Between Home Screens: You can move apps around within a home screen and between home screens. To do so, again you tap and hold on any app icon until the apps start wiggling. Then tap on the app you want to move and drag it to your desired location for it. Rapid App Switching: The iPad has an elegant system for switching rapidly between recently used apps – via its Multitasking Bar. You double-tap the Home button to pull up the Multitasking Bar. It will show you all of your recently used apps – and you can switch into any of them by just tapping on them on the bar. If you swipe to the right on the Multitasking Bar you also have access to basic controls for the iPod app, a brightness slider control, and the screen orientation lock. 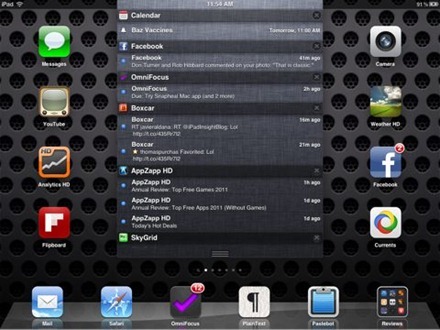 In iOS 5, you can also enable multitasking gestures to switch between apps, as mentioned above. The iPad is quite an intimate device, one that you may find yourself using while laying down on a couch or in bed quite often. At these times and others it can be very helpful to lock the iPad’s screen orientation into landscape or portrait mode to suit what is most comfortable for you. The easiest method for this is to assign the button just above the volume control on the right side of the iPad to this function. You do this in Settings > General > Use Side Switch To – and choose ‘Lock Rotation’. 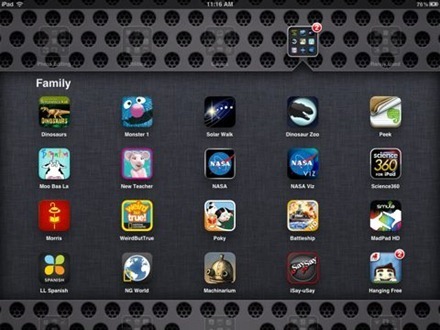 Once you get to know the App Store you will probably find that your collection of iPad apps grows very quickly. Soon you may have many home screens worth of apps and it can become a bit of a challenge to organize them. Folders are a huge help in this area. You use folders to house groups of apps and help arrange apps and home screens in a more helpful way. For instance, you might group all your games into one (or more) folders, and all your newspaper and magazine titles into another folder, all your utility apps in another, and so on. To create a new folder you tap and hold on any app icon and then drag one app onto another one that you want to group it with in a folder. That will create a new folder, to which you can then add further apps (up to 20) as desired. – Tap and hold the image within the email. A dialog will pop up with two options – Save Image and Copy. Save Image will save it to the Saved Photos (on the original iPad) or Camera Roll (on the iPad 2) album in the Photos app. Copy will place it on the iPad’s clipboard, available to be pasted wherever you want (in a new mail or a word processing app for example). – Same as above really. Tap and hold on the image. You’ll get a popup dialog with four choices. The first three relate to the web page itself. The next two choices though are the same as in the Mail app – Save Image and Copy, and will get you the same results. Choose your own wallpaper for the home and lock screens: Everybody likes making the iPad a little more their own by customizing their wallpaper choices. Putting a cute picture of a loved one or pet on your lock screen, for instance, adds a great personal touch to your device. – Go to the Photos app and choose an image you’d like to use as your wallpaper. Tap on it to show it in full screen view. Then tap on the Sharing button at the top right of the screen (the envelope with arrow through it icon, just to the left of the trash can icon). This will popup a dialog with a short set of sharing options – tap on ‘Use as Wallpaper’. Then the next screen will let you choose whether to set this wallpaper for use on the lock screen, the home screen, or both. – Go to the Settings app and choose the Brightness & Wallpaper section in the left pane. Then tap on Wallpaper over in the right pane. In the Wallpaper section, you can choose from built-in wallpapers, or photos and images in your albums. You can also add more wallpaper choices via several third party apps that you can find in the App Store. These should add themselves to the Wallpapers library. We tend to share some of our favorite iPad wallpapers on most weekends. You can take a look at some of our favorites in our iPad wallpapers section. In the Settings app, tap the Picture Frame bar in the left-hand pane – it’s the fourth item down, below Wi-Fi, Notifications, and Brightness & Wallpaper. – Select which of your albums you want to include, transition effects, whether to zoom in on faces, and so on. 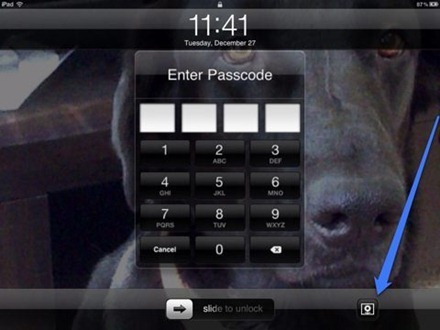 – Then put the iPad in sleep mode and press the Home or Power button to wake it back up. Don’t slide to unlock. Instead, tap on the button just to the right of the slide to unlock bar (with a flower icon it). How To Show the Battery Percentage in the Status Bar: If you like keeping track of how much battery life your iPad has left, you may want to choose to have the remaining percentage displayed in the status bar at the top of the iPad screen. To toggle this feature on or off go to the Settings app, and tap on the General section in the left pane. Towards the bottom of the list of items in the right pane, you’ll see Battery Percentage – just tap to set it to On or Off. How To Enable the Caps Lock function: By default the Caps Lock function is not enabled for the iPad’s on-screen keyboard. I much prefer to have this turned on. If you feel the same, it’s easy to do. To do so, go to Settings > General > Keyboard – and just tap On for the ‘Enable Caps Lock’ entry. Notification Center: Finally, a much nicer way to handle notifications – and even to see much ore than just the most recent one. Mutitasking Gestures: These allow you to swipe with four or five fingers to pinch back to the home screen from within any app, swipe up from the bottom of the iPad to reveal the multitasking bar, and to swipe left and right to move between recently used apps. Tabbed Browsing in Safari: This has been around in some 3rd party browser apps for a while now, but it’s great to see it added to the built-in (and excellent) iPad browser. Safari also has a slick ability with these that I’ve not seen in other apps – tap and drag to move re-order tabs. 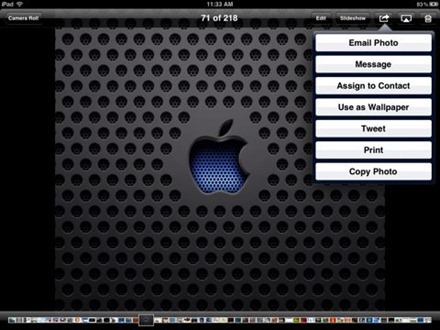 ‘PC Free’ Features: iOS 5 means far less need to ever connect your iPad to a computer. You can activate and setup a new iPad without connecting to a PC, and it also offers WiFi sync, OTA (over the air) OS updates, Photo Stream to sync photos to all your iOS devices, and iCloud backup. See Storage Space Used by Your Installed Apps: Before iOS 5 you could only see a totla amount of space used by all apps on the iPad – and even that you could only see in iTunes on a PC when the iPad was connected. Now you can look at the General > Usage section in Settings right on the iPad itself and see how much space is being used by each and every installed app. You can even drill down on each app and see how much space is taken by its data / documents and how much by the program itself. Twitter Built Right In: In iOS 5 Twitter is heavily integrated right into the OS – and you can now tweet directly from within built-in apps like Safari, Photos, Maps and more. AirPlay Mirroring: This is maybe THE big showcase feature of iOS 5 – especially for iPad users. It allows you to mirror everything you do on the iPad – wirelessly – to an Apple TV. Games that are optimized for this (like Real Racing 2 HD) look and work tremendously well so this should be a killer feature for gamers. It should be a huge feature for business users and for teachers and anyone doing presentations. With an Apple TV costing just $99 this is an awesome way to be ‘untethered’ when presenting from an iPad – making live demos easy and just offering a wealth of possibilities. *** Note – AirPlay Mirroring is for the iPad 2 only. Look for Apps Designed Specifically for the iPad: Your mileage may vary, but I have found that although nearly all iPhone apps do work on the iPad, very few of them are a pleasure to use as genuine designed-for-iPad apps are. They look rather silly and small at their normal size and often look blurry and odd when run in 2X mode. 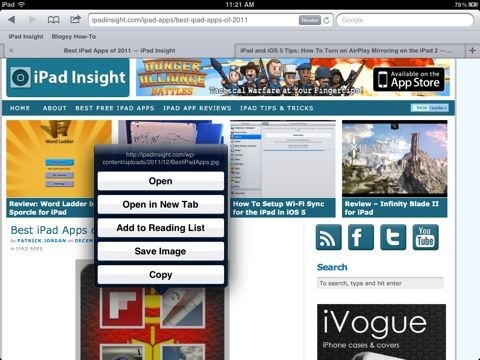 Where possible, it is best to look for universal apps or apps made specifically for the iPad. On the iPad itself the App Store does most of this work for you. In iTunes on the computer you can toggle between iPhone and iPad sections of the App Store and look out for apps that carry a little grey + symbol which denotes a universal app. It’s a Major Fingerprint Magnet, Think About a Screen Protector: Many folks are not fond of using screen protectors with iPhone or iPads – but you will quickly notice that the iPad (despite all the blurb about its oleophobic coating preventing this) is constantly showing tons of fingerprints that detract from its loveliness. I use a Ghost Armor screen protector, but there are many good solutions available for the iPad from a number of good vendors. It’s well worth looking into finding a good screen protector, as they also offer scratch protection and should keep the iPad screen from being constantly covered in fingerprints. You should also look to get a good set of microfiber cleaning cloths to keep handy. I know these sound like a bit of a silly accessory to think about, but believe me you will be very glad to have them around. Here is an article on a particular brand of these that I can highly recommend. Accessories: As you might expect given the huge popularity of the iPad, there are tons of accessory vendors providing a very broad range of accessories for the device. If you become a heavy user of the iPad it is likely you’ll want to get at least a good case and stand for it. One of Apple’s most useful iPad accessory is a Camera Connection Kit – for transferring photos to the iPad from iPhones and cameras. 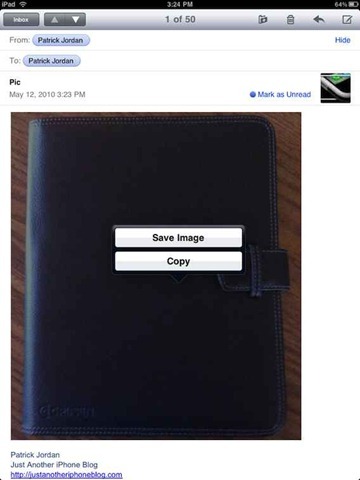 Another, if you own the iPad 2, is the superb iPad 2 Smart Cover. 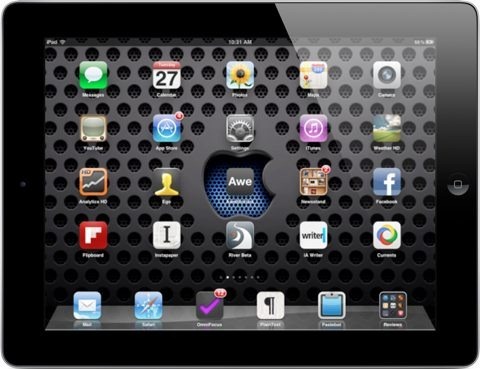 To see some of our favorites you can have a look at our iPad accessory reviews. – Keep your brightness set to just halfway or less on the slider control for it (which you can adjust in Settings or in the Multitasking Bar). – Keep key battery-hungry services turned off when not needed. These services include Bluetooth, WiFi, and Cellular Data (if you have the WiFi + 3G model). – QuickOffice and Documents To Go: Two of the leading apps for both viewing and editing MS Office docs on the iPad. Office2 HD is another good option here. – Apple’s iWork Suite for the iPad: Pages, Numbers, and Keynote make up this suite for the iPad. They are Apple’s word processing, spreadsheet, and slide presentation apps for the iPad. They are very capable office-style apps, have very easy to use and attractive interfaces, and are able to import and export in Office-compatible formats. Remote Access to your Windows Machines: If you can’t find the right iPad MS Office app for your needs, or you have a specific company app you need access to, the best solution may be to just use a remote access app. You can remotely access and work with both Mac and Windows machines via VNC, RDP (Terminal Services) and other popular remote access methods. Again, there is a good range of solid apps for this purpose. A couple of the best I’ve seen for accessing Windows machines are LogMeIn and Wyse PocketCloud. Please fire away with questions in the comments here on any other iPad subjects you want to know about, and I’ll do my best to provide good answers. Sorry, but I need to disagree with you on this. I’ve seen a very tiny number of occasions where an app stops responding and you cannot even return to the home screen or open the multitasking bar – maybe 2 or 3 times in nearly two years of heavy iPad usage. The vast majority of the time, you can return to a home screen and you can invoke the multitasking bar and you can close the offending app via that bar. I just bought a wifi version and I am trying to figure out how to get it to ‘refresh’ certain apps (primarily news sites, ie WSJ, Reuters, etc) for my non-wifi train journey into the office each day. Right now, these apps seem only to refresh when I open them and tell them to do so. Is there a way to say, basically, ‘refresh these apps every morning at 7am’? Thanks for your help. Your site and tips are very helpful. Terry – glad you’re enjoying the site and finding it helpful. On your question, there is not any way to do exactly what you’re after. The closest thing would be to use one of the news aggregator apps – like Flipboard, Zite. Skygrid or another similar one. You can customize the sources that you see in those and then at least it would just be one app to refresh before your morning journey. Hi, I have an original iPad and understand that mirroring is only available with iPad 2. I was wondering if there is a way to hardwire my iPad via HDMI to a projector TV? I want to enjoy the content I stream to my iPad via the Crackle app. Enjoyed your insight on the iPad. You don’t need mirroring in order to enjoy content from Crackle on a big TV – as long as you have an Apple TV. AirPlay Mirroring is when everything you do on the iPad 2 is mirrored to your TV wirelessly. Crackle supports standard AirPlay, which allows you to stream video and audio to your HDTV via Apple TV. Sometimes when I try downloading an app I will get a pop up message saying “unable to connect with I tunes”. Anyone have any idea why and how I can fix this ? It only happens sometimes. — Your iPad doesn’t have a good WiFi or 3G connection at that moment. If you’re seeing any difficulty in web pages loading in the iPad Safari app or emails nor sending / Inbox not downloading mail then it’s likely you need to find better connectivity. — The App Store itself is having a tough moment. If this is the case, the issue usually does not last long at all. Generally just trying again in 5-10 minutes (or even right away or just a couple minutes later) will get you past this. I have not yet bought my iPad as I am concerned about how easily I will be able to connect it to my printer and PC to transfer photos or documents? It looks like it will have to be done wirelessly and my printer is HP (Officejet Pro 8500) but not one of the HP ones listed as compatible from what I have read about AirPrint, although it has an Ethernet logo on it. It’s quite important that I’m able to transfer stuff from the iPad to the PC/Printer so how easy is it or am I going to have to buy a new printer as well? Thank you very much for your comments – a great help. When connecting to my pc to synch the ipad it starts synching before I have chance to select the items I want to sync, how do I stop this happening. Also i am having trouble getting some picture files to load up to the ipad. any ideas? The pictures I save on my iPad from emails I receive often appear blurry. Is there any way to correct this? Any comments on not being able to download Flash on the iPad? Is there any work-round for this lack? So many websites require Flash, and it makes the iPad often useless. There are a few browsers that can display Flash content on the iPad (Photon, Puffin). I have just purchased a new I pad 2 and a Kodak printer which I was told I could print to from the I. Pad . Unfortunately although I have done a lot of reading around the subject. I am afraid I don ‘t feel confident about what to do. I tried to register my printer with iCloud but the I Pad keeps telling me there is no Aiirprinter available. I knows printer and IPad are connected to the same WI FI network. Can you help please.? Thank you for this very good post! It is an excellent primer which is helping me with my brand new iPad. I like the black theme of your ipad, where can i find it? Thanks! I’m one of those “seniors” learning on my own – and appreciate all the help I can find. How do I create sub folders in mail to move messages to for storage? Spent 7 hours with the official technical group from Three.co.uk (based in India )and still cannot get connected to iTunes to use the new iPad. After I plug in a digital AV adapter to my iPad2 then connect to my tv what do I have to do to make it work? I saved pictures from Facebook on my ipad, but for some reason I can’t find them anywhere. Thank you for this very helpful post, I find my free time is getting less and less the more I get into my iPad! What a wonderful site and info! Although I’ve been a Mac person for years, I have yet to get an iPad. A friend on Facebook posted don’t Buy and iPad until checking out your http://ipadinsight.com/ipad-mini/my-new-ipad-mini-is-bigger/ So I went to your site and started wandering around. I got very excited when, after reading about how to take screen shots with the iPad, I tried it on my iPhone. It worked!!! I am beyond thrilled and grateful. Thank you. Thank you. Thank you. You’re very welcome. Glad you’re finding the site helpful. A question, Patrick, since you invite questions here. A friend was visiting and I wanted to see if Google Hangouts would work on her iPad when I was in Broadcast mode (from my Mac). Unfortunately she did not remember her Apple password when she went to download the Google Plus app, so she did “forgot password”, set up a new one. Then for some reason it would not accept the password she noted down as the changed one. The “unfortunate” part of this is that the email address her son set her up for was a .me.com (or whatever) iCloud address. Given the password has changed she is blocked out of accessing email to wherein she could try “forgot password?” changes again. Can you offer any solutions? Right now, though past contract deadline, she plans to go to an Apple store when back up North to talk to someone there? I’m not sure I’m following the chain of events clearly, but I think it sounds like she may need to go to icloud.com and either reset the password or do the ‘forgot password’ routine to get an email sent to whichever is her alternative email address. Thanks for responding to this one, Patrick. I think we did try going to iCloud. In event she is almost on her way home, so will get it settled up North. Simply asked, in case you had had a similar experience. And, while I’m asking questions, Patrick, will the iPad Google+ app allow one into a Hangout during streaming broadcast? I am new to this and it would not let my iPhone in. I kept getting a message that the Hangout had expired when I responded to the invitation. And, if I did a Hangout that was not broadcasting, my iPhone could get in. Thanks again, for your help. Most appreciated. Sorry, I’m not sure what you mean by broadcasting. Can you explain? I wanted to do this with my iPhone (me or my friend) on it and the iPhone kept getting rejected. When I did NOT “enable hangouts on air” the iPhone was able to be a participant in a hangout. So, I’m wondering if you knew if the iPad user could be a participant in a “live broadcast” hangout. I will actually try it in another day or two with another friend who has an iPad. OK, I understand what you’re asking now – but I don’t know the answer for you. I know I’ve joined hangouts from the iPad, but not sure if any were broadcasting. Thanks for replying. I may be able to try it tomorrow. Will let you know.